Helen Stipp, 87, of Erie, passed away at 11:48 p.m., Sunday, January 27, 2019 at the Guest Home Estates in Erie. She had been in failing health. She was born on August 8, 1931 at Thayer to Lloyd and Nona (Hizey) Gough. Helen grew up in the Thayer and Galesburg area and attended country schools and Thayer High School graduating in 1949. She and Dean Stipp were married on February 28, 1949 at the Neosho County Courthouse steps in Erie. He preceded her in death on February 1, 2015. Helen and Dean lived in the Thayer and Galesburg area for several years before making their home at Erie in 1960. Helen was a homemaker and also drove a school bus for CUSD 101 school district for special education children. She additionally worked a Western Auto in Erie for 10 years. Helen enjoyed gardening, bird watching, going to bluegrass festivals and leading Bible study groups in her home. 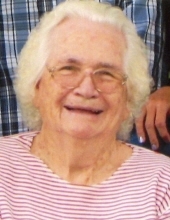 She loved spending time with her grandchildren and family and going to the family cabin on Labor Day weekends. She attended the Erie Christian Church and the First Baptist Church at Erie. She is survived by two sons, Lonnie Stipp, and his wife, Tohnjua of Erie and Gary Stipp, and his wife, Karen of Erie; two daughters, Vickie Smith of Erie and Donna Lowe, and her husband, Bill of Sand Springs, OK; 13 grandchildren; 27 great-grandchildren; three great-great grandchildren; her brother, Bill Gough of The Villages, FL; his sister, Lois Kramer of Galesburg; and several nieces and nephews. In addition to her husband she was preceded in death by her brother, Glen Gough. To send flowers or a remembrance gift to the family of Helen Stipp, please visit our Tribute Store. The family will receive friends at the Pierce-Carson-Wall in Erie from 6 to 8 Thursday evening. Funeral services will be held at 10 a.m., Friday, February 1, 2019 at the Pierce-Carson-Wall Funeral Home in Erie with Pastor Kenny Richards officiating. Burial will follow in the East Hill Cemetery. "Email Address" would like to share the life celebration of Helen Stipp. Click on the "link" to go to share a favorite memory or leave a condolence message for the family.